Where you see one rat, there are ten more you don't" – a saying that did not originally apply to house hold pests. From the moment they laid low mighty Avras, the Vermin used cunning tactics and ingenious weapons to augment their multi-tudinous hordes. Dominion over swathes of Vetia proved a simple proposition to the Vermin, and while tribes of men and beasts held them at bay with ferocity or tribute, it was centuries before their supremacy was challenged. In the events leading to the dawn of this Ninth Age, the might of men broke the Vermin Swarm and cast down their King. Fear of Sunna's godly strength sent them scurrying, but I suspect only ingrained cowardice keeps them from sweeping forth again. Reports of man-sized rats with gleaming eyes and sharp black blades always abound, but few consider these isolated incidents to be cause for concern. Still, some cities maintain a Sewer Watch, and their veterans do not scoff at the Vermin threat. There is no longer any doubt that vermin still live, but since being driven back into the earth by Sunna’s victory it is hard to gauge their strength. Unable to work beneath the light of the sun they must contest for the gloomy depths; no doubt some of their old tunnels remain, but without their former vigour, it is dubious whether they have been maintained. Scholars debate: did their defeat cause a weakness of the mindor did their habits, their lack of sunlight and fresh foodcause a weakness of the body? Whatever the cause, they are a broken nation, and long may they remain so. It is reported that in other lands, away from the light of Sunna, they have retained a fraction of their former hubris. There are tales from the north of whitefurred snow vermin, who live in cold castles of ice, still carrying the eagle standard. Likewise, the Daeb must be lax in their stewardship of the Westlands, for there are reports of vermin ships calling out of the ports of Silexia to harry our galleons. I am, as yet, unconvinced by these tales, but it is clear that there is much we don't know about the former scourge of humanity. It is interesting that you say the vermin were daemonic followers of the Dark Gods. Perhaps you do not realise your deviation from orthodoxy on this point. With the notable exception of the rat King slain by Sunna, vermin are mortal beings. Likewise as the scriptures state in Genesis 3: In the final years of the Avrasi the vermin came forth, born of a triple treachery. Gaius Dexion, the proud soldier, betrayed the Senate; and the high priest Quintus Augustus betrayed mankind. As Dexion and his everyoung Queen brought war to Avras, Augusts in despair treated with the vermin gods to bring their spawn upon the city, hoping thereby to stop the civil strife. The final treachery was that of the vermin themselves, turning on humans and devouring the entire city whole. These are the scriptures handed down to the Church. Note that it is the “vermin gods” who are mentioned here. Likewise two accounts of those who have spoken with supernals give the same testimony: that the vermin deities, foul though they may be, are not aligned with the Dark Gods in their opposition to mankind. My father said he’d met one once, in some hovel near Ullsberg. A piteous thing, it spent the whole night trying to convince papa of the glories of Vermin "civilisation". It said that every citizen got a vote, choosing their leaders and their laws. That they elected a ‘senate’ and ‘consuls’ after the fashion of the Avrasi Empire. The rat even had the nerve to call us uncivilised for lacking the same rights! Now, father listens for a while – how he manages not to laugh, I’ll never know – but eventually he asks what, if the glories of the sewer so outshine our humble kingdom, it is doing here. It transpires that the creature’s mate fell out of favour, and was assassinated, and it, a female, had to flee the kingdom. The best part is, its mate was killed by a ‘dusk senator’– this glorious civilisation puts assassins on the legislature. And I thought politics here was cut-throat. It is with some frustration that I must admit to never having seen a rat, despite all I write here. I have in a number of cities searched out the gloomy wharfs and taverns which those black marketeers are said to frequent, to no avail. Perhaps it is the final fading competence of the vermin that their illicit operations are so rarely detected.The vermin were ever fraudsters, unable to create anything new but forced to ape the great nation of Avras. They surely lack the ability to create anything the surface world would wish to purchase openly, instead subsisting off the transport of poisons, drugs, slaves, magics and weapons.Though I have never met the vermin, I have met many human smugglers that perhaps deserve the label. Some men have lost the ability to feel shame in dealing with them. While the rodents may find more reliable economic partners among goblins and infernal dwarves, there is surely no shortage of their "wares" found in Vetian cities. The traders in the east are unable to provide the same quantities as last year. They blame the vermin. As you know, in parts of Sagarika, men and rats live side by side, oblivious to the clear danger. 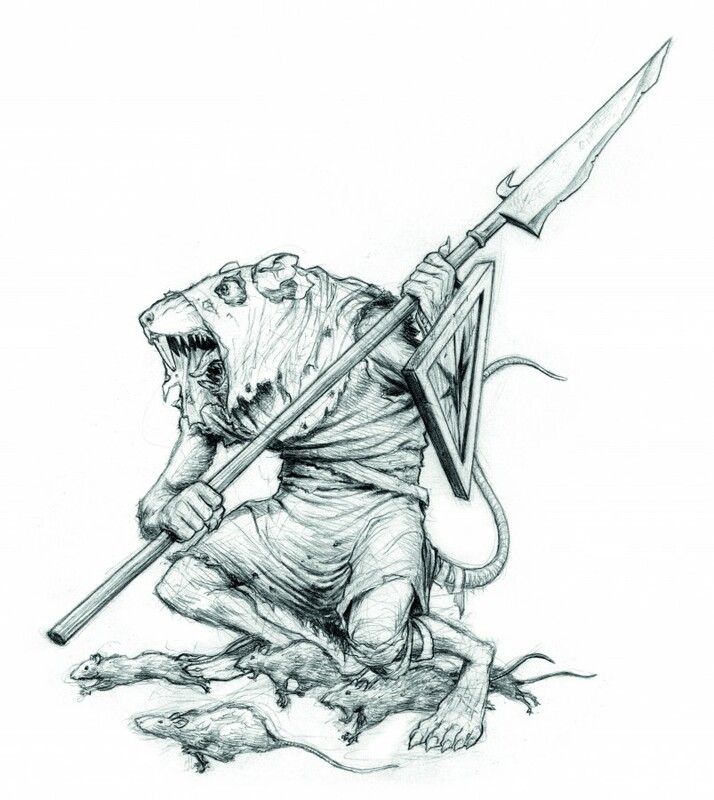 Until recently, these vermin worshipped rat gods – twisted versions of the gods of old Avras. But when plague struck the land, they say a rat went among them, preaching of a new god, the Plaguebringer, who offers salvation through the touch of disease. The pestilence lingered around those who worshipped it and eventually the new cult was driven out, but not before inflicting terrible losses in men and cattle, dealing a crippling blow to our trading posts. I suggest we redirect funds towards ourinterests in Qassar. They may not be as profitable but hopefully we can bolster our inventory for the coming year, and profit from the inflated price of spices. Today I was most grateful to one Herr Himmelblau, a magnate of the League of Cogs, who sent me a device discovered in an abandoned spacebeneath one of his warehouses. The opportunity to examine such a find is a rare luxury, for I am in no doubt that the icy black crystals within the contraption are darkstone. Only the vermin swarms have mastered the substance - despite the claims of Eichtal's alchemy professors (who swear their stricken colleagues are nothing to do with their experiments) and the insistence of egomaniacs like Oppolzer who believe the vermin incapable of anything more than stealing cheese. I confess my own investigation of the device was hardly more successful than the alchemists' bumbling efforts; a sudden surge of white energy has already demolished one of my bookshelves. Still, every indication confirms the evidence of my other researches - that the vermin are somehow able to magically empower the stone and use its electric properties to fuel their industry and armies. The captives claiming to be from "House Rakachit" swore under interrogation that theirs was just one of many guilds and families by which rodent society is organised - and indeed seemed to show pride that Rakachit was the greatest among these "houses" when it came to the use of darkstone. When my studies of the Book of the Dead are complete, I must turn my full attention to this fascinating field.